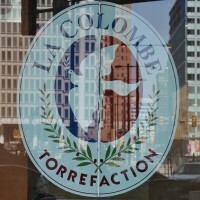 La Colombe, the Philadelphia-based coffee shop/roaster chain, has branches in five US cities, ranging from Boston in the north to Washington DC in the south, as well as expanding west to Chicago. Blagden Alley is one of four branches in the nation’s capital, and has been here for three years, set in what was an old Department of Transportation bus depot/garage, an amazing setting for a coffee shop. Long and thin, Blagden Alley has incredibly high ceilings and multiple windows, allowing the sunlight to stream in, particularly in the middle of the day and during the afternoon, where it lights up the exposed brick and plain plaster. 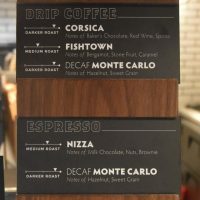 All the usual La Colombe staples are here, with multiple options on espresso, bulk-brew (drip) and pour-over. There is also a small selection of cakes and savoury pastries. 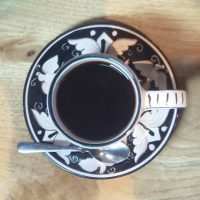 The coffee is split into Classic and Workshop brands; the Classic is a darker roast, more old-school and includes blends such as Corsica on drip and Nizza on espresso, where it’s joined by decaf. The Workshop is focused on single-origins and lighter roasts, with one each on drip and espresso, plus three on pour-over. The specific beans on offer change every two months or so. I discovered La Colombe in its hometown of Philadelphia, visiting the glorious Dilworth Plaza branch. There I was recommended the Lafayette Street branch in New York City (several New York baristas suggested it too). However, they might have meant the flagship store at 400 Lafayette Street, near Union, which I only discovered having already visited 270 Lafayette. Although it looked impressive, there was a line out of the door when I went by, so perhaps I chose wisely. Although Lafayette Street shares many things with Dilworth Plaza (excellent coffee, splendid crockery, soaring glass windows, high ceilings, interesting mural on the wall, no Wifi or menu, forcing you to engage with the lovely, friendly baristas) in many ways they’re like chalk and cheese. Compared to Dilworth Plaza, Lafayette Street is tiny, although by NYC standards (eg I Am Coffee, Gimme! 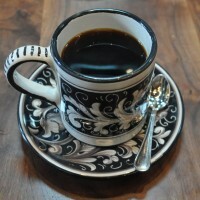 Coffee, Bluebird or Everyman Espresso) it’s positively huge. However, it lacks Dilworth Plaza’s open spaces, multiple seating options and there’s nowhere to linger at the counter and chat with the baristas. That said, given how busy it is, it wouldn’t be practical if there were. La Colombe is, according to my host, Greg of Coffee Guru App fame, something of a Philadelphia legend and it’s not hard to see why. Although it has branches around the country, including New York City, its home is in Philly. 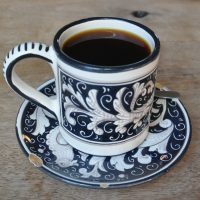 As well this chain of coffee shops, La Colombe roasts all its own beans in the Fishdown district of Philadelphia, not far from the centre, where it has a new flagship cafe. At Greg’s recommendation, I visited the Dilworth Plaza branch, right by City Hall, smack bang in the centre of Philadelphia. 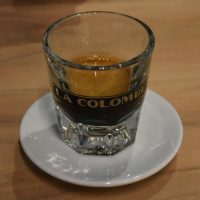 La Colombe offers espresso, the obligatory bulk-brew, iced coffee and, for filter coffee, it uses the famous steampunk machines. 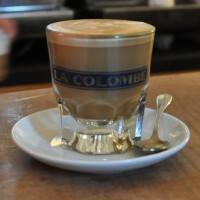 Something that sets La Colombe apart from the crowd is an insistence on only serving one size of drink (8 oz). No buckets of milk here! Interestingly, there’s no menu, which, according to Katrina, my barista, forces customers to engage with the staff. And vice-versa. Certainly in the case of my visit it worked really well! There’s also no Wifi, another move designed to promote conversation and interaction. As much as I like my free Wifi, I can only applaud the sentiments behind this decision.